With back-to-school season fast approaching, most of us would probably start complaining about how traffic in Manila is bound to be more terrible. As we find ways to maze through the city just to get to school or work, we would be riding cars or using public forms of transportations. But what if you’d have to swim your way to receiving an education? Three years ago, children from the remote mangrove village of Layag-Layag, Brgy. Talon-Talon, Zamboanga City did just that. They had to swim for a stretch of 5km everyday just to get to the school in the nearby island. This changed when Dr. Anton Lim and Mr. Jay Jaboneta founded the Yellow Boat of Hope Foundation. Their initial purpose was to provide boats for these children to use to get across the water and for parents to use them in between school hours for livelihood. At present, Yellow Boat of Hope has branched out to 11 communities in Zamboanga, Masbate, Cagayan De Oro, Negros Occidental, and Davao Oriental among others. Likewise, their goals have also expanded into providing scholarships, school supplies, medical missions, and livelihood programs for their partner communities. 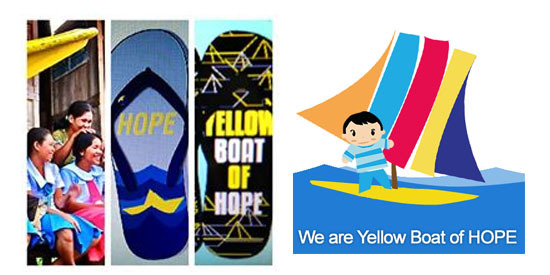 On its third year, Yellow Boat of Hope partners up with Banana Peel Flip Flops and Talk ‘n’ Text for a special campaign entitled iBoat. The aim of this project is to emphasize how everyone’s different roles in society come together to build the future of our children. It also aims to highlight every child’s basic right to proper education, regardless of their social status. From students, to policemen, to lawyers and the likes, the iBoat team has handpicked 100 individuals who perform different roles in society. They have photographed these people along with their own answer as to how they contribute to societal change. Listing also the help of some of the country’s most influential people, iBoat spearheads an interactive online campaign that invites savvy internet users to follow in the likes of Marian Rivera, Itchyworms, and the officers of the National Youth Commission by posting their photo with their completed answer to the caption “iBoat to_____” on their fan page. Following the success of the suspended coffee movement abroad, an act of charity that allows diners to pay for coffee and snacks in advance to be given to the less fortunate, Banana Peel has also started to offer suspended slippers. With every purchase of any flip flops from selected branches, customers can avail of as many suspended slippers as they want by just adding 50 pesos for each extra pair. These slippers will be distributed to the children of the Yellow Boat of Hope community to help them in their pursuit to a proper education. Available denominations are P5, P10, P100, P300, and P500. This amount will be deducted from your airtime load. Disclaimer: This is a press release provided by the company concern and posted as is. This is being posted in order for some readers to know that may be interested in the said campaign. Yellow Boat of Hope in partnership with Banana Peel and Talk ‘n’ Text invites all of you to visit the Facebook page by clicking here to find out how you can participate in the movement and create change.